What is the mandibular advancement device known as SomnoDent? The answer is simple — YES! A mandibular advancement device is made to be comfortable so that you can sleep without even noticing you’re wearing it. It does not prevent you from breathing with your mouth open and will even eliminate snoring for patients with sinus congestion or allergies. 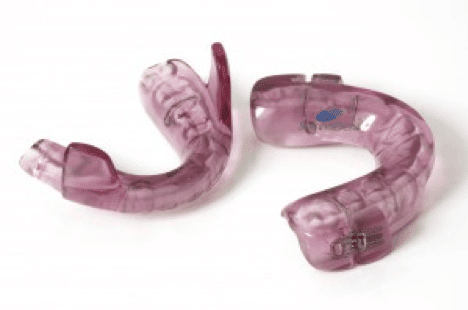 You may experience some slight stiffness of the jaw for the first few mornings after wearing the device, however this feeling is only temporary and will go away after waking up and removing the device. Are you drowsy during the day with no explanation? Do you snore loudly or wake up breathless in the middle of the night? If you’re experiencing any of these symptoms, you may be one of more than 12 million Americans who are affected by sleep apnea. If you have tried the CPAP and found that it didn’t work for you or you would prefer a similar alternative treatment. In our office, we specialize in the use of SomnoDent a SomnoMed oral appliance for successful treatment of sleep apnea and snoring. We can fabricate an oral appliance that is shaped much like upper and lower mouth guard and is worn throughout the night, while sleeping. Using a SomnoDent is a lot like wearing a retainer. SomnoDent helps keep your airway open, allowing your body to breathe naturally. Best of all, SomnoDent makes no noise. So, it is easy to share a bed again with your partner. Our team can help you every step of the way. We invite you to call us at (813) 540-7467 to schedule our sleep apnea assessment visit. There are three categories of sleep apnea. The most common is called obstructive sleep apnea (OSA) and occurs due to a physical blockage, usually the collapsing of the soft tissue in the back of the throat. Less common is central sleep apnea (CSA), in which breathing stops because the muscles involved don’t receive the proper signal from the brain. Further, some people suffer from “mixed” or “complex” sleep apnea, which is a combination of obstructive and central. Obstructive sleep apnea is more common in males than females, and it is more common in older adults (40+) than younger adults and children. However, anyone — regardless of gender or age — can suffer from sleep apnea. Other risk factors include obesity, smoking, drinking, use of sedatives or tranquilizers, and family history. Central sleep apnea strikes most often in people with heart disorders, neuromuscular disorders, strokes, or brain tumors. It is also more common in males. Treatments for sleep apnea depend on the severity of each individual case and the type of apnea. Basic treatment can be behavioral — for instance, patients are instructed to lose weight, stop smoking, or sleep on their sides instead of on their backs. Beyond that, oral devices can be used to position the mouth in such a way that prevents throat blockage. In more severe cases, surgery may be the best option. Contact our practice, and we can refer you to a sleep apnea specialist. The specialist may recommend a “sleep study” to diagnose the precise extent of the problem and can prescribe appropriate treatment. Depending on the patient’s situation, treatment may involve an oral device that we can custom-create for you. Wondering if SomnoDent would be right for you? Call one of our offices at (813) 540-7467 to learn more and schedule an appointment!